Source: James Anthony Froude, 'The Commonplace Book of Richard Hilles,' in Fraser's Magazine for Town and Country, August 1858, Vol. LVIII, No. CCCXLIV, page 131. How we shall have game and sport enow. Now we shall have game and sport enow. This carol is considered by Richard Leighton Greene and others as being the older of the two known versions. The other version was printed by Wynkyn de Worde in his Christmasse Carolles Newly Enprinted, 1521. See: As I Came By A Grene Forest Syde - 1801. This article was reprinted in The Living Age, Volume 58, No. 748, September 25, 1858, Enlarged Series, No. 26, page 965. Wynkyn de Worde's version, "As I came by a grene forest syde" (1521), was not printed in Froude's article. Padelford, Dyboski, Flügel, and Greene carry both carols. Flügel: with yer he goth, yer he goth, yer he gothe, how! 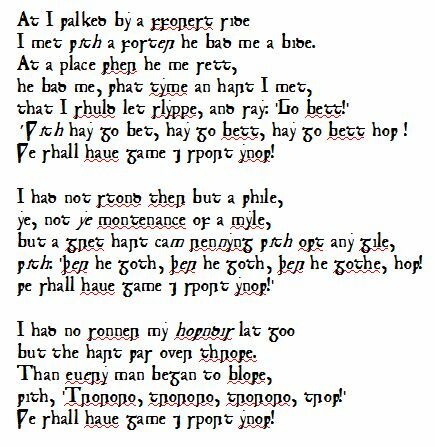 Padelford: with: 'Yer he goth, yer he goth, yer he gothe, how! The manuscript is on-line in the Balliol College Library, Manuscript 354, folio. 178, pp. 374-375. Dr. Edith Rickert writes that "Hey go bet" is a hunting cry. Although she does not include this song as a Christmas-tide song, the substantially similar version of the carol, "As I came by a grene forest syde," was reproduced in Wynkyn de Worde's Christmasse Carolles (1521). From this we can conclude that this was a song sung during the Christmas-tide. Note that at one time, the hunting season for the wild boar was from Christmas Day to Candlemas (February 2). Froude article, 'The Commonplace Book of Richard Hilles,' was the first mention of the Hill Manuscript that I've found so far. Dyboski's Songs, Carols, and Other Miscellaneous Poems was the first to give us a reprinting of the Christmas songs and similar content in the Hill Manuscript. Anthony Wood or Anthony à Wood (17 December 1632 – 28 November 1695) led a life entirely devoted to antiquarian research. His major work was History and Antiquity of the Universitie of Oxon, later translated into Latin and published as Historia et antiquitates Universitatis Oxoniensis. Wood bequeathed his library of 970 books and 127 manuscripts to the Ashmolean Museum, which in 1858 was transferred to the Bodleian Library. See: The Boar's Head Carol - Wood, 1660. Thomas Hearne (July 1678 – 10 June 1735) was an English antiquarian, who discovered the Wynkyn de Worde Christmasse Carolles fragment. He was assistant keeper of the Bodleian Library from 1699 to 1712, when he was appointed second keeper, a post he held until 1715 when he was elected Architypographus and Esquire Bedell in civil law in the university. He published numerous books and manuscripts; his research was valued due to its depth of scholarship. Much of his library found its way to the Bodleian Library, Oxford. His edition in four volumes (1813–20) of Anthony à Wood's "Athenæ Oxonienses and Fasti." "Reliquiæ Hearnianæ; the Remains of Thomas Hearne," consisting of a selection from his voluminous manuscript diaries. The "Account of the Christmas Prince as it was exhibited in the university of Oxford in l607," which was written by Griffin Higgs. See: The Boare Is Dead before the Christmas Prince, 1607. A selection of "Bibliographical Miscellanies," of which one number only appeared in 1813 in 104 copies, which included notice of Wynkyn de Worde's fragment from 1521, plus the Christmas carols printed by Richard Kele in the mid-1500's that had been discovered "by a friend," whose name is unknown. See: Kele's Christmas Carolles. Thomas Frognall Dibdin (1776 – 18 November 1847), an English antiquarian and bibliographer, the author of numerous bibliographical works including in 1810 a new and much extended edition of Ames's Typographical Antiquities, which contained in Vol. II a reprint of Wynkyn de Worde's carols plus a three-page insert concerning the Boar's Head Carols, said to have been prepared by Philip Bliss; see Dibdin On The Boar's Head Carol. Between 1810-45 he exchanged letters with Philip Bliss (see Add MSS 34567-81, in the British Museum).